The Wills Wing T2 is a highly refined high performance, competition class glider featuring a long list of hardware upgrades and improvements in the sail design. The result is an extraordinary combination of superb handling qualities and unsurpassed performance, built on a platform of exceptional quality. The T2 features a robust yet light-weight carbon fiber crossbar, a cam-less, wide range VG system, and a highly rigid sprog stability system with compensating inboard sprogs. The sail is clean and flat, with a very high percentage of double surface and extremely low twist. Roll pressures are light and the roll rate is quick, and yet the glider is stable on tow, offers excellent directional tracking, and is easy to land. The exceptional sink rate and climb performance allow for an expansion in the upper end of the weight range, allowing a pilot in the transition range between sizes to step down a size, and pick up further enhancements in glide performance at speed. For serious recreational and cross country pilots, or for anyone with advanced skills looking for the highest levels of flex wing performance at a surprisingly affordable price, the T2 is configurable with a long list of options, including all mylar top surface sail, special UV resistant "UVM" mylar sail material upgrade, ultra-light weight, extra stiff 12mm battens, carbon-kevlar leading edge pocket inserts, Slipstream2 or Litestream control bar downtubes, a specially designed carbon streamlined basetube or the standard aluminum streamlined basetube, and streamlined control bar basetube wheels set (aluminum basetube only). 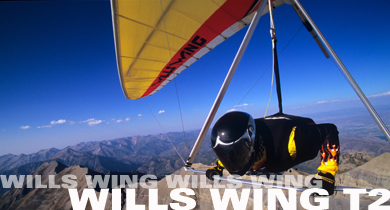 Competition pilots seeking the ultimate in world class competition level performance are encouraged to check out the Wills Wing T2C. This is the total combined weight of the pilot, clothing, harness, parachute, helmet, and any and all other items attached to or carried on the pilot’s body or harness. 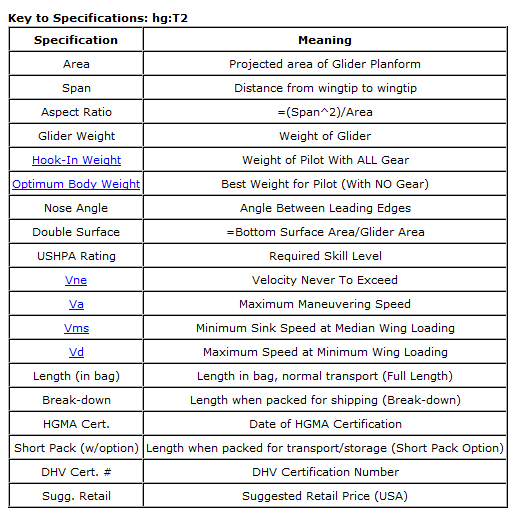 The range of hook in weights given is the range for which the glider complies with the performance, stability, control and structural requirements of the HGMA Airworthiness Standards, or, in the case of a glider that does not meet HGMA standards, it is the range for which the glider is approved for operation. Since the hook in weight range represents the complete range of weights at which the glider can be operated while meeting minimum performance, stability, control and structural standards, there is substantial overlap in the hook in weight ranges for different sizes of the same model. Therefore, hook in weight range is not the best specification to use when choosing the best size of a given model for a given pilot weight. Compare this to Optimum Pilot Body Weight. This is the weight range within which a given glider offers the optimum combined levels of performance and control. In general, this weight range is specified without overlap between successive sizes of the same model, so that it can serve as a clear recommendation, for a given pilot, of which size glider is considered optimum. It is expressed as body weight, rather than as hook in weight, because most pilots more accurately know their body weight, and because changes to hook in weight that involve adding or subtracting weight in the harness or accessories do not have the same implications for which glider size is optimum as do changes in the pilot’s body weight. (For example, you don’t get stronger when you add weight to your harness.) Pilots who are near the dividing line of optimum body weight between two sizes of a given model glider can elect to go to the larger size if they wish to optimize for sink rate performance in light conditions, while sacrificing somewhat in control authority in stronger conditions and glide performance at higher speeds, or to the smaller size if they wish to optimize for control authority in stronger conditions and glide performance at higher speeds, while sacrificing somewhat in sink rate performance in light conditions. It is generally not true that landing becomes easier by going to the larger size glider – in general, the slightly slower minimum flying speed advantage is more than offset by the reduction in landing flare authority on the larger size. For pilots near the dividing line, a lower level of pilot skill or experience generally indicates that the better choice is the smaller size. Compare this to Hook In Weight. The placarded maximum speed that should not be exceeded for safety when flying in smooth air and in straight flight. The placarded maximum speed that should not be exceeded for safety when flying in turbulence or when maneuvering. 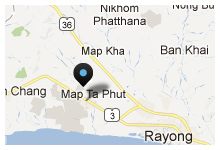 The speed at which the minimum descent rate is obtained. The maximum steady state speed, at minimum recommended wing loading, for a pilot in a normal prone position, pulled all the way in.